"TO THOSE WHO SHALL SIT HERE REJOICING, TO THOSE WHO SHALL SIT HERE MOURNING, SYMPATHY AND GREETING; SO WE HAVE DONE IN OUR TIME. 1892 A.D.W.- H.M. I would assume that the A.D.W. stands for Andrew Dixon White the co-founder of Cornell University. I'm not sure of the H.M. I like the bench as it reaches across time to speak to us today. It helps to put thing in perspective. 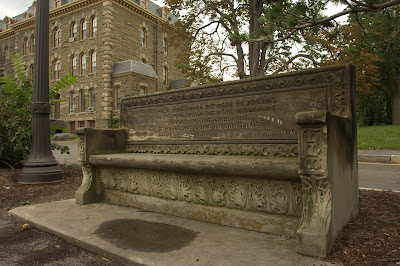 It's a great bench for overlooking Cayuga Lake far below the University. Photo details: Exposure time 1/25 sec, Aperture f/8.0, ISO 100, Focal Length 17 mm, 35 mm equivalent focal length 28mm, Lens Canon EF 17-40mm, tripod. That's a grand OLD bench! I love it and am saddened there is graffiti on it. . . and I don't mean the inscription which is beautiful. The designs on the edges are particularly beautiful. I think you may "win the prize" for the oldest bench unless Malyss has older ones in France! Thanks for sharing! It was absolutely of the monumental kind, as it should be in those settings. So is the inscription - very fitting for a University. And I have been working at a University for most of my active life. Wonderful bench to span the passage of time and reflect as you so eloquently put it, Steve. I like the location under the sheltering branches of a grand tree.